Happy day-after-Thanksgiving! I hope you had an amazing, food-filled day with your friends and family. We had our usual giant feast and I’m SO full. But not too full to keep me from sharing a new recipe with you! 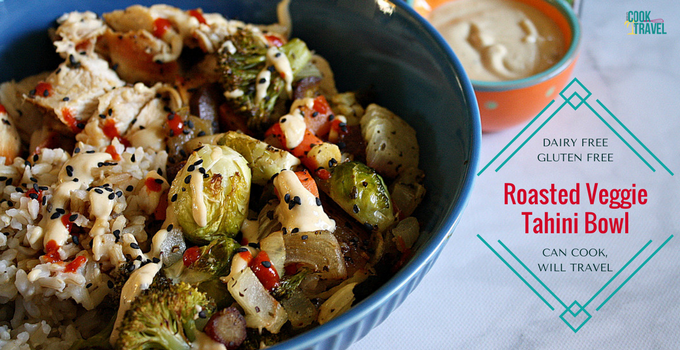 This week I’m sharing a recipe I created for a Roasted Veggie Tahini Bowl. You see, I’ve become a bit bowl obsessed this year, if that’s a thing. 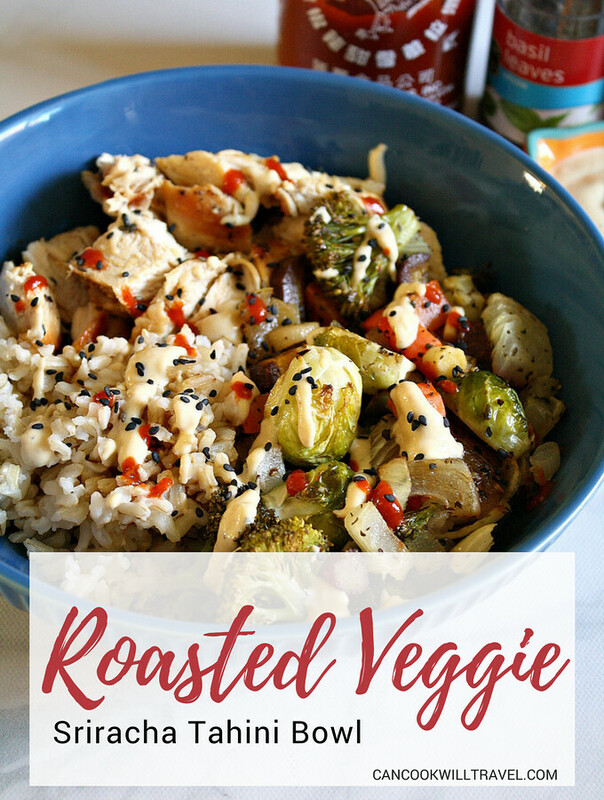 I love roasting veggies, adding some protein, a grain, and lots of flavor to it, and devouring. So I felt it was only fair to share another bowl with you. What I love about this Roasted Veggie Tahini Bowl is that it’s kinda perfect for the day after a holiday. You could easily sub out the chicken that I used for leftover turkey or ham, which is what our family usually has. Plus when you have leftover veggies in the fridge, it’s a great use for them. In this case, I used carrots, Brussels sprouts, and broccoli that I had on hand along with some onion to roast. The veggies then get tossed with EVOO (that’s extra-virgin olive oil), salt, pepper, dried basil, and red pepper flakes. Then they’re roasted to perfection. I always try to have either quinoa or brown rice in my fridge when I need a meal fast, so I used some brown rice I’d cooked earlier. And another trick is that I will cook chicken breasts in a pan, use one for a bowl, then refrigerate the rest. The leftover chicken is perfect for more bowls, to add to a salad, or throw in a soup. And then comes the tahini sauce, and that was a total experiment that worked out well! I had been wanting to make a sauce out of tahini and I thought this Roasted Veggie Tahini Bowl would be the perfect way to do that. So I mixed together tahini, water, EVOO, salt, pepper, and minced garlic. I stirred, tasted, adjusted the flavors, and repeated. It ended up creating a nutty, garlic-y sauce that couldn’t have been easier to make. For the leftovers I had a thought, and I tweaked the sauce with some maple syrup and HOLY SMOKES it was fabulous! You could easily make the sauce, chicken, rice, and even the roasted veggies in advance if you wanted to. So talk about major meal prep for the week if you do that! When it comes to putting the bowl together, I simply grabbed a large bowl and started throwing stuff in. First goes the rice, 1 chicken breast diced up, a nice serving of roasted veggies, and then I added a splash of tamari sauce over the top for a salty finish. 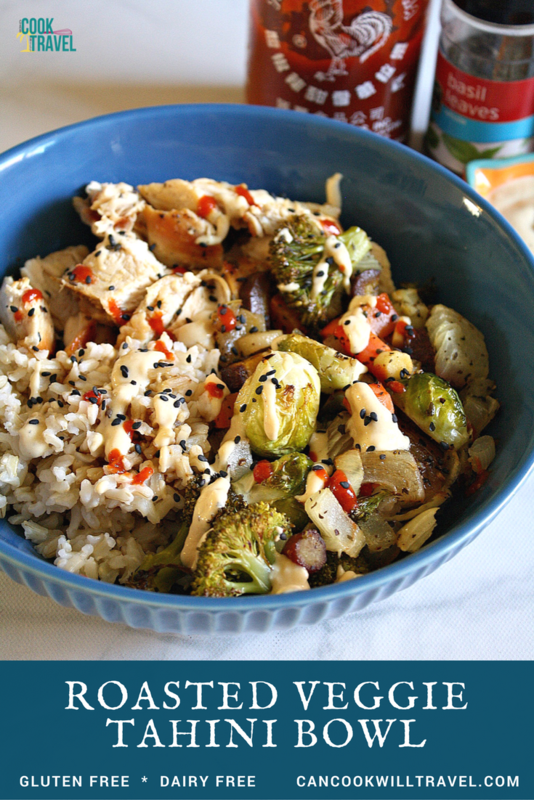 Then I drizzled the tahini sauce and some Sriracha over the top and voilà the Roasted Veggie Tahini Bowl was complete! The Sriracha absolutely adds a kick to the dish, so feel free to skip it if spicy isn’t your thing. But it’s definitely my thing, and it’s delightful! I like adding spice to my foods, because I find that it kinda perks up all of the flavors much in the way lemon juice can do that. This Roasted Veggie Tahini Bowl is totally calling your name, because it’s healthy and packed with awesome flavors and textures. Nutty, creamy, caramelized bites with some crunch and the heartiness of the rice makes for a delicious dish. So click the link for the recipe and step by step instructions! Happy bowl making (and licking)! 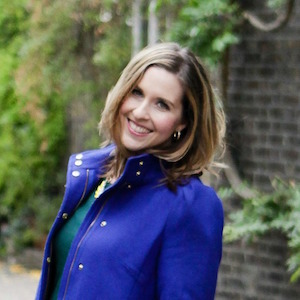 One year ago: Thankful for Thanksgiving Vegetable Dishes! Two years ago: Apple Pie Pancakes . . . Yes, They’re Just As Good As They Sound! Five years ago: Apple Cranberry Pie … Happy Thanksgiving to Me!